Resort Executive Chef Jason Brumfiel recognizes that there are many local and regional resources available to create an outstanding menu and dining experience at The King and Prince. He has recently started tapping into these resources and has been highlighting many local farms on our menus. Here are a few local farms and companies we are happy to be supporting. Sapelo Farms in Brunswick, GA has been producing local, sustainable agriculture since 1947. The 180 acre oasis consists of open pasture as well as a conservation wildlife habitat. Heritage breed chickens, percentage Boer goats and Santa Gertudis cattle roam the fields while the flower gardens are home to 50 Italian Honey beehives. Fresh, local produce and herbs are available through a CSA (Community Supported Agriculture) membership. Some produce that is grown on there farm is:broccoli, cabbage, beans, kale, carrots, arugula, squash, melon & mustard greens. City Market Seafood has been serving the coastal community of Brunswick, GA since 1948. Brunswick was known as the “Shrimp Capital of the World” and to keep up with the demand for the sweet Georgia shrimp, City Market purchased a packing house right on the banks of the Brunswick River in 1987. Shrimp boats would unload their daily catch for it to be packed and processed. The business has been owned and operated by the same family since the 40’s and prides itself in supplying some of the finest seafood on the East Coast. Seafood can be purchased from their store on Gloucester Street in Brunswick and you can also have fresh shrimp shipped to your door from their website. 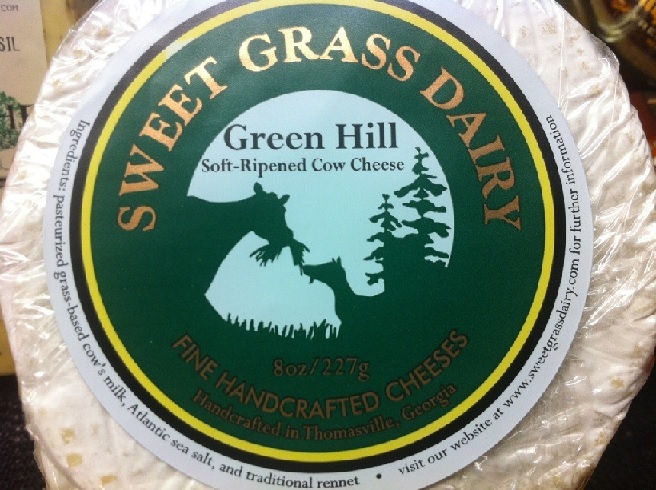 Sweet Grass Dairy is a grass-fed, family owned dairy farm located in Thomasville, GA which was founded in 2000.In 2005, Jeremy and Jessica Little took over the operations and it is clear from their success that dairy runs deep in this family business. Jessica is the daughter of Al & Desiree Whener who come from a long line of dairy farmers by way of Western New York after Al’s ancestors immigrated from Germany. Today, they have a desire to change American’s perspective on food by educating the public on their efforts to raise grass-fed cows who are treated humanely and like a member of their own family. Their hand-crafted, old world style cheeses highlight the high quality milk that is used for their delicious cheese. Products include: “Green Hill” a Camembert style cheese, Nature’s Harmony Fortsonia Cheese, “Lovely” Gruyere Cheese, Asher Blue Cheese and Thomasville Tomme just to name a few.